A DApp (decentralized app) refers to a web-based application. It makes use of a decentralized, public and cryptographically authorized ledger system to enable the exchange of information among users. It means that, unlike standard, traditional apps, no central body holds the authority to own or manage a DApp. Instead, all participants have access to the same data of the application. And if there’s any change required, it can be made through a consensus. So, when someone adds new information, it gets stored on all computers, regardless of how many they are in numbers in the network. While centralized servers manage the traditional applications, DAPPs offer P2P (peer-to-peer) data exchange by using a cryptographically enforced consensus. In the current information and technology market landscape, decentralized applications are in use for not only storing and managing financial transactions but also for all sort of information, including intellectual property, personal identity, smart contracts, and last but not the least, healthcare data. Decentralization in the digital world has opened gates to new opportunities in the healthcare industry. Shifting to a decentralized and cryptographically enforced database can revamp the healthcare sector in unique ways. Using DAPPs for Healthcare can enable real-time sharing among users, which is the best selling-point of decentralized apps in healthcare. For instance, when two patients have similar symptoms, different practitioners may use different treatment methods to achieve the same result. One prescription may prove to be more helpful than others, but both practitioners are working without any interaction, therefore, a little space is left for one to learn from another. Here, DAPPs promise to shift hospital data systems onto a shared network. Consequently, it enables the exchange of data in real-time from one end to the next. If a practitioner prepared a prescription for a disease, the data would be automatically shared with every participant using the DApp to see it. It applies to patients visiting hospitals having being treated somewhere else. Then, a doctor would be able to determine what the other hospital has administered to the patient before and make a versed, accurate decision. Although decentralization and blockchain have their own privacy and security concerns, they still are a much safer option for storing and disseminating digital information, given their robustness against risks like hacks when compared to traditional data systems. Moreover, cybercriminals usually target hospitals, as their most data gets stored in discrete, isolated central servers. Central servers are more prone to be compromised. However, in a decentralized world, all information gets distributed and shared over many points on the network leaving no single point of failure. Therefore, it becomes more difficult for hackers to tweak or alter stored information in the system. Having a decentralized network or a DAPPs that connects numerous health practitioners and health organization can prove to be quite revolutionizing when dealing with epidemic cases. Further, a distributed, immutable and trusted stream of data about ongoing diagnostics can bring every concerned person on the same page at all times. Not only this, DAPPs could also enable the sharing of clinical trials, research, safety analysis and advanced directives, therefore, enhancing collaboration. Blockchain-based decentralized applications can significantly streamline the communication part among staffs in health organizations. If the staff of a hospital has complete access to data, it can work more efficiently under less supervision. Keeping everyone informed in the loop regarding hospital operations can make administration, as well as daily processes such as patient verifications and insurance claims, much easier. 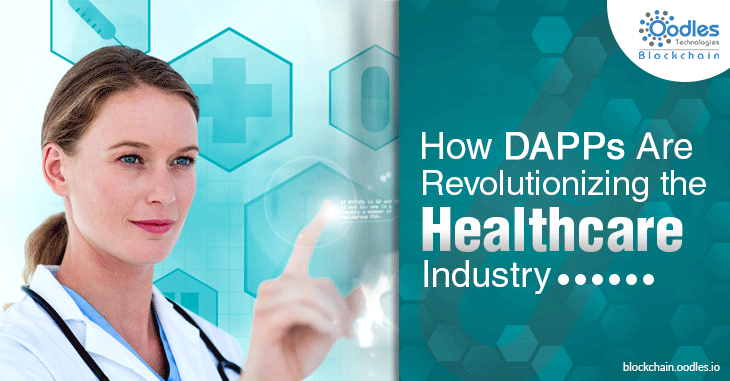 If we consider the significant contribution of DAPPs for Healthcare, it is evident that decentralization application development services have a lot more to offer the healthcare industry. Although DAPPs for Healthcare may take a while to take hold of the sector, with the support of prominent government entities like Health Information Technology, and the Federal Drug Administration, as well as giant cooperation like IBM Watson Health, the revolution could be expected sooner than later.